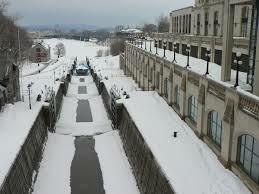 The 200-kilometer-long (but only 1.6-meter-deep) Rideau Canal, joins Ottawa with Kingston on Lake Ontario. It was formerly planned as a strategic route between Montréal and Lake Ontario; the armed need for which was established during the war with the United States in 1812. In summer, the canal and locks are an active waterway, and in winter, the iced up canal becomes a frivolous area for skating and festivals. Château Laurier is one of the impressive buildings on the canal banks. Nonetheless it has the air of a medieval castle; it was essentially built in 1912 and is a prime illustration of how big Canadian railroad companies added grand hotels (and striking landmarks) across Canada.